The boom in trained service animal use and access has transformed the lives of travelers with disabilities. As a result, tens of thousands of people in the United States and Canada enjoy travel options that were difficult or impossible just a few years ago. Henry Kisor and Christine Goodier provide a narrative guidebook full of essential information and salted with personal, hands-on stories of life on the road with service dogs and miniature horses. As the travel-savvy human companions of Trooper (Kisor's miniature schnauzer/poodle cross) and Raylene (Goodier's black Labrador), the authors share experiences from packing for your animal partner to widely varying legal protections to the animal-friendly rides at Disneyland. Chapters cover the specifics of air, rail, road, and cruise ship travel, while appendixes offer checklists, primers on import regulations and corporate policies, advice for emergencies, and a route-by-route guide to finding relief walks during North American train trips. 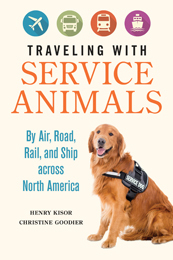 Practical and long overdue, Traveling with Service Animals provides any human-animal partnership with a horizon-to-horizon handbook for exploring the world. Henry Kisor is a retired book review editor and literary columnist for the Chicago Sun-Times. His books include What's That Pig Outdoors? A Memoir of Deafness and Zephyr: Tracking a Dream across America. Christine Goodier is a freelance travel writer.